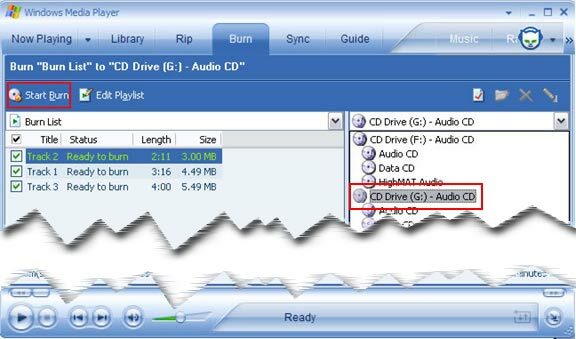 How to convert WMA file to plain MP3 with TuneClone from Windows Media Player? TuneClone is a powerful music converting utility designed for virtually burning WMA, M4P, M4B, protected DRM music files to a special virtual CD-RW drive where you can easily get unprotected MP3, WMA or WAV files ready for use on any music devices. Step1. Make sure you are running TuneClone. step2. 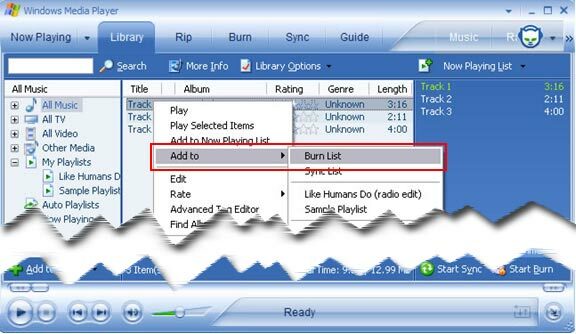 Create Burn List in Windows Media Player. After you run Windows Media Player, please click "Library" tab to create your playlist. Click "Add to Library..." menu item to choose music files from your hard drive. You can choose to add selected music or the whole folder, even the URL link of the music to the library. Adding all selected music files to the library, please right-click on the music file and choose "Add To" and then select "Burn List". Step 3. Start Burn in Windows Media Player, get plane MP3 file. Click "Burn" tab to come to the burn window. Firstly, please choose CD Drive(K:)-Audio CD as the burner. Then click Start Burn to begin burning. 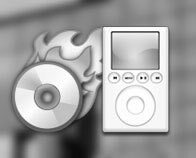 After burning, all converted music will be loaded to TuneClone virtual CD-R. While the burning started, TuneClone will automatically convert the music file to MP3, WMA or WAV, you can open the manager screen to show all the converted music files. The most import step is to choose the cd burner, then the software can convert automatically. It is especially easy when you want to batch convert lots of files.